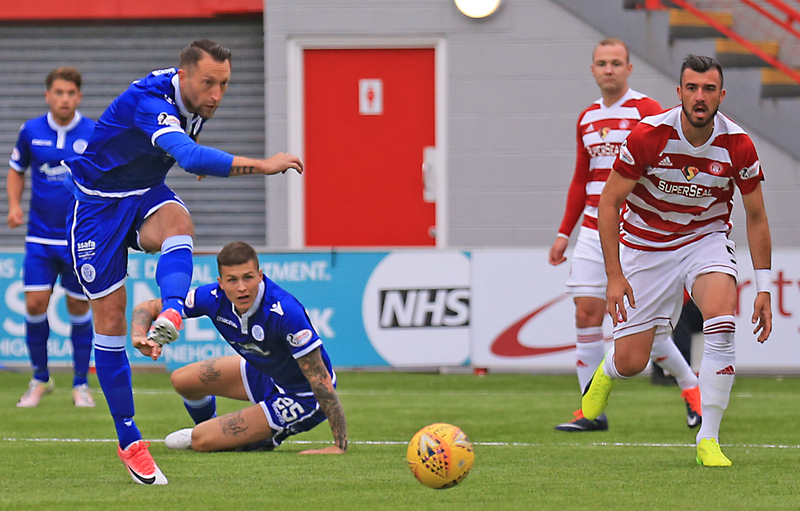 IT WAS Déjà vu for the Doonhamers at New Douglas Park, now known as the SuperSeal Stadium, as they lost out 6-5 on penalty kicks for the bonus point, the second time in the space of five days for Gary Naysmith?s men. It certainly wasn?t a thriller in South Lanarkshire but the match burst into life when Hamilton Accies substitute Steven Boyd rifled home what everybody thought would be the winner. But Queens equalised 60 seconds later when goal machine Stephen Dobbie tapped home to earn a point and send the tie to penalty kicks. The Doonhamers came into the tie knowing it was a must-win fixture after dropping valuable points against East Kilbride at Palmerston on Tuesday night. Realistically three points was required for the Dumfries men to have a chance of either winning the group or going through as one of the top four second place group teams. Queens made two changes to the side who drew 0-0 with the Lowland League champions. Scott Mercer made his first appearance of the season in the place of new signing Shaun Rooney. 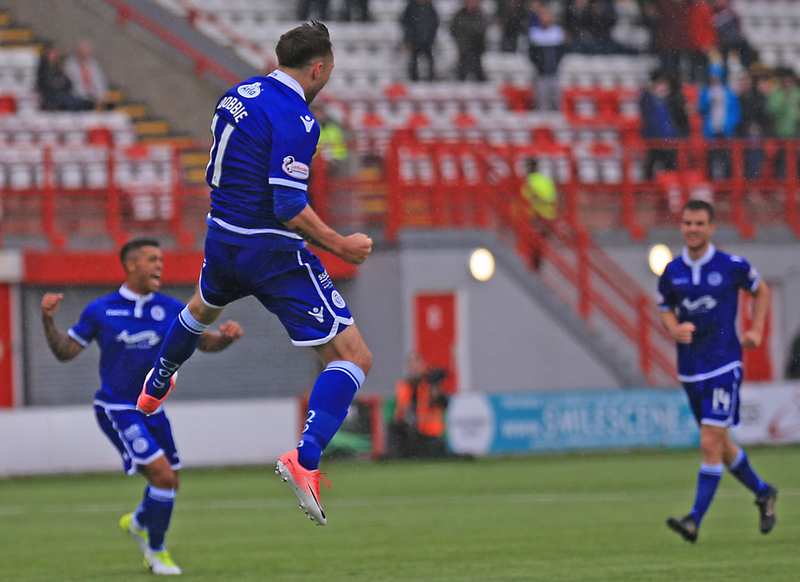 Lyndon Dykes returned to the starting eleven in the place of veteran striker Derek Lyle. It was a darn miserable afternoon in Hamilton, our first visit since 2014 when Accies beat Queens 3-1, with outpours of wind and rain throughout the afternoon. It was a reasonable start for Queens and young winger Connor Murray had the first chance of the afternoon when the play was switched from the left to right. The youngster took a touch and hit a shot from 25-yards, which trickled wide of Gary Woods net. 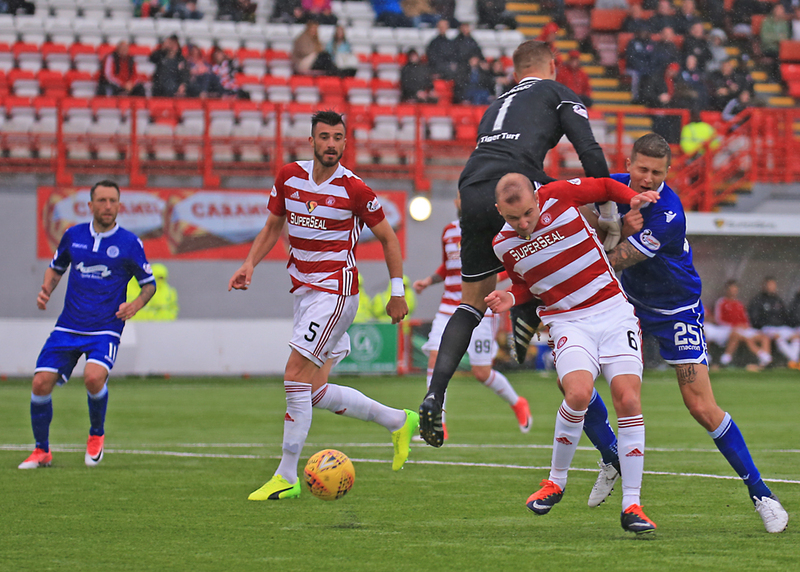 The Premiership side were soon in on the action when captain Dougie Imrie brushed off pressure from Jordan Marshall on the right and whipped in a dangerous ball into the box. Striker Rakish Bingham got on the end of the cross but was caught with ease by Queens number one Alan Martin. It was Queens? turn to attack and the 288 Queens supporters must have thought they were about to take the lead when Dobbie found space in the box but he dragged a shot wide from eight yards. McMann on the left and hit a low powerful cross across goal towards Dykes. The Australian couldn?t manage to get a vital touch on the ball. There was very little chances to note in a dour first period. The highly regarded Ali Crawford had a strike parried away by Martin whilst Kyle Jacobs and Lyndon Dykes both had chances but couldn?t call Woods into action. The start of the second period was very low key with very little action. Crawford?s free-kick from 20-yards tested the movement of the Queens supporter in the stand behind rather than Martin the goal. The majority of the match at this point was played in the midfield with Jacobs proving why he?s such a vital part of the side making some sublime crunching challenges. It would be the former Livingston man who would force Queens? best chance of the second half when he put in an inch-perfect challenge inside the Queens half and set the advancing Dobbie forward. The striker was in space a plenty, and looked set to be joined by Dykes but he was brought down by a defender, and pulled the trigger from 12-yards but his shot was deflected into the side netting. he shrugged off the pressure from Mercer and Jacobs on the edge of the box and fired a decent effort into the arms of Martin. The Doonhamers burst forward on the right with Dobbie placing a beautiful delivery in the box but Dykes couldn?t get a touch to it, a carbon copy from the first period. Martin was called into action on 67 minutes when McMann`s shot at first didn`t look dangerous but the former Sons keeper made a tremendous one-handed save, which then smacked the bar. The minutes were dwindling away and the prospect of a second penalty shootout in a week was certainly on the cards. However it looked like the men in red and white were guaranteed all three points on 88 minutes when Marshall and Darren Brownlie both failed to properly clear their lines and the ball fell to substitute Steven Boyd who thumped a superb 14-yard screamer into the top corner of the net that left Martin no chance, his first goal conceded from open-play. The majority of the 1047 in the stadium had little time to celebrate as the Doonhamers hit straight back with their first shot on target of the match. A mistake from the Accies` backline coupled by the presence of Dykes gifted Dobbie the ball six yards out and all he had to was take a touch past the keeper and tap home into the empty net. Referee William Collum blew for the full time whistle as both sides earned at least a point, with one going on to win a bonus point via spot-kicks. 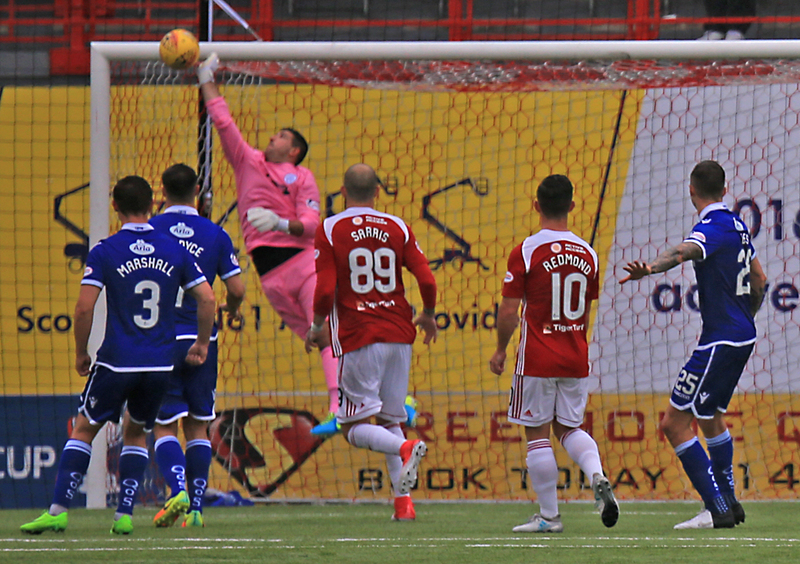 Queens took a two-goal lead in the shootout thanks to two Martin saves and penalties from Lyle and Dobbie. It seemed to look like Queens supporters would head down the M74 with the bonus point and a slim chance of progressing as group winners however missed penalties from captain John Rankin, Dykes and Brownlie saw Queens lost the shootout 6-5 and be on the end of two spot-kick defeats in the space of a week. FULL TIME HAMILTON 1-1 QOS- Hamilton win 6-5 on pens for bonus point. The Doonhamers remain top of the group but as Queens aren`t in action on Tuesday, Hamilton could overtake them in first place. Queens finish off their group campaign next week against League One outfit Albion Rovers at Palmerston Park. 14:40 Two changes for the Doonhamers for this crucial Betfred Cup group match. Mercer & Dykes slot in for Lyle and Rooney, who drop to the bench. 14:45 Hamilton xi; Woods, McMann, Tomas, Gillespie, Imrie, Bingham, Crawford, Gogic, Longridge, MacKinnon, Sarris. 3 min Murray tries his luck from 25 yards but drizzles wide. 4 min Martin comfortably gathers the ball from Bingham`s header. 5 min Dobbie fires wide from 10-yards. 7 min Stirling`s crosses from the right but Dykes can`t connect with the ball. 7 min A positive start from the Doonhamers here. 10 min Gillespie fires a long range effort well over the bar. Still 0-0. 12 min Crawford`s shot is parried away by Martin. 21 min Jacobs` long range effort flies wide. Still 0-0. 27 min Dykes brings the ball down but his shot trickles wide. Still 0-0. 35 min Imrie`s long range effort goes over the bar. 45 min Stirling wins Queens a corner. Half Time Both sides have had chances to get the breakthrough but it`s still goalless here at SuperSeal Stadium. Half Time Attendance here at SuperSeal Stadium is 1047. 288 Doonhamers making the trip. 53 min Jacobs makes another superb challenge, getting a stud in his foot for his troubles. 58 min Dobbie`s shot is deflected out for a corner. 63 min Templeton`s shot is saved by Martin. 66 min Dobbie`s ball from the right is swung in but Dykes cant get a touch. 68 min Martin gets a palm on McMann`s shot that hits the post. Still 0-0. 73 min Sarris` shot trickles wide of the post. 85 min Martin pulls off remarkble save to deny Crawford. 89 min Boyd volleys home after a Brownlie mistake. 16:48 For the second match this week we are heading to pens. 16:50 Hamilton to take the first pen. 16:52 Dobbie makes it 2-0. C/mon. almost taste this bonus point. 16:53 Crawford scores to make it 2-1. 16:53 Dykes pen is saved. 2-1 still. 16:53 Sarris levels the pen kicks 2-2. 16:54 3-2 Jacobs after four pens each. 16:54 Bingham needs to score to keep the tie alive. 16:55 Rankin misses we are equal. 3-3 after 5. Sudden death. 16:55 Boyd gives Accies the lead for the first time in the shootout. 16:56 Hamilton regain the lead. Tapping needs to score his penalty. 16:56 And does, we keep on going here. 16:57 Better tell my mum I`ll be late tonight as Hamilton score again. 16:57 Brownlie`s misses his penalty. Hamilton take the bonus point.